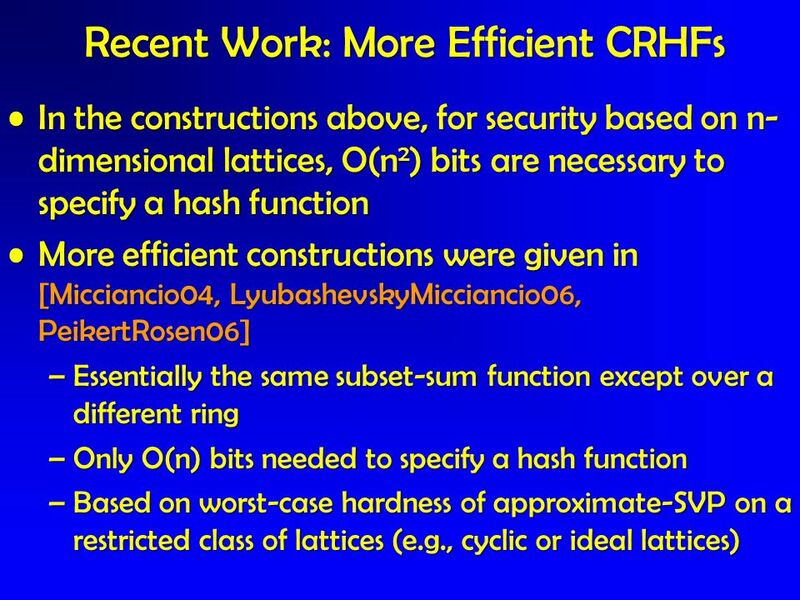 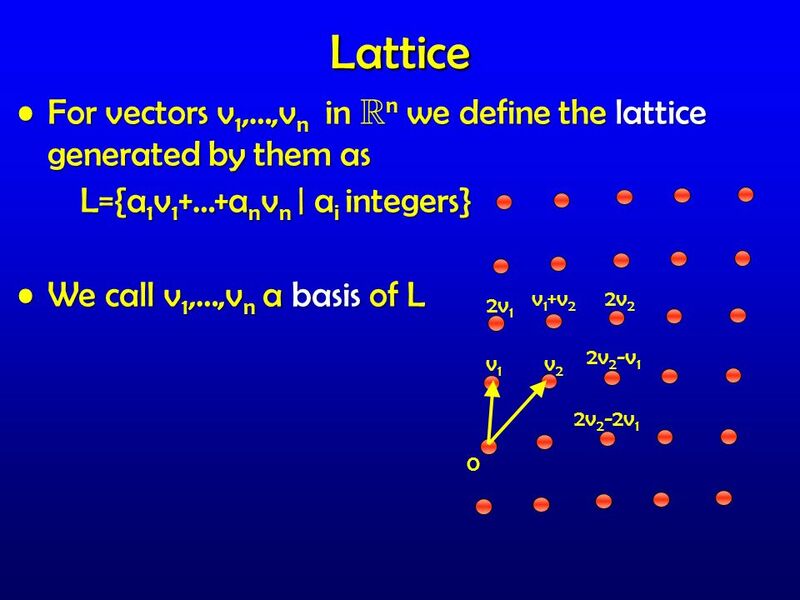 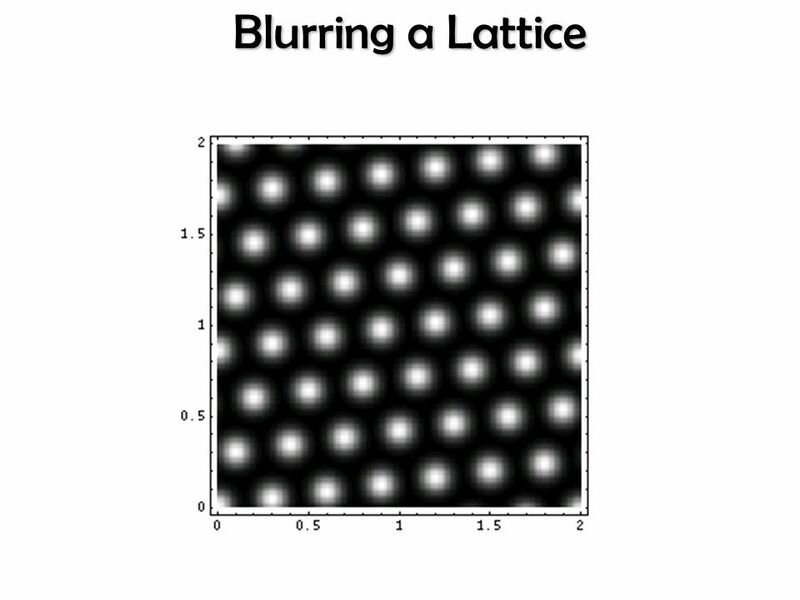 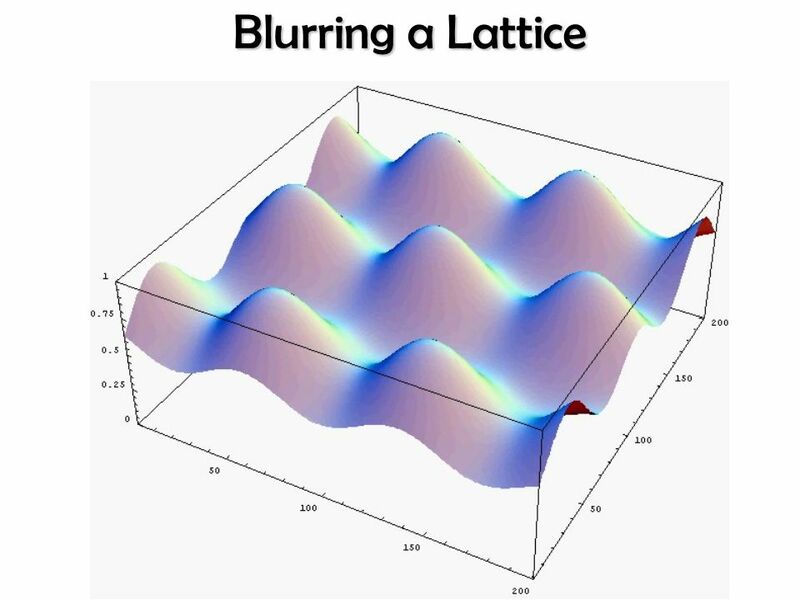 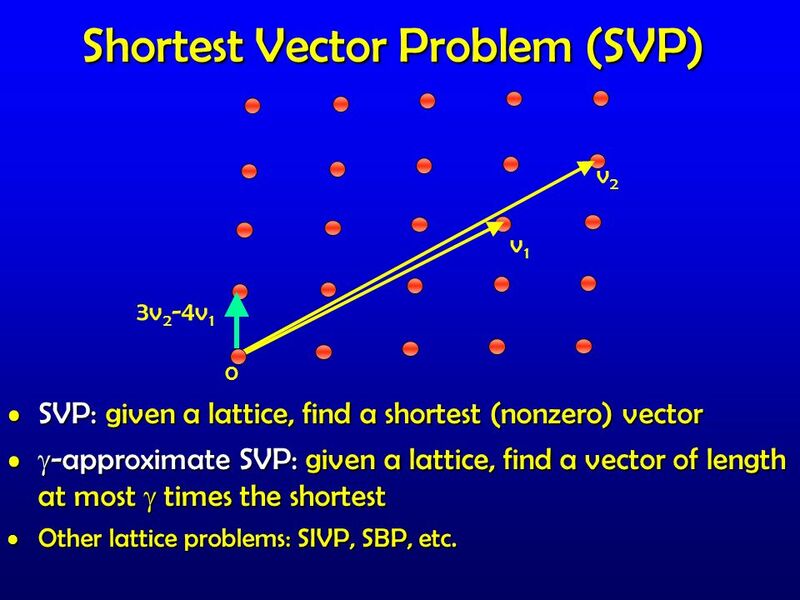 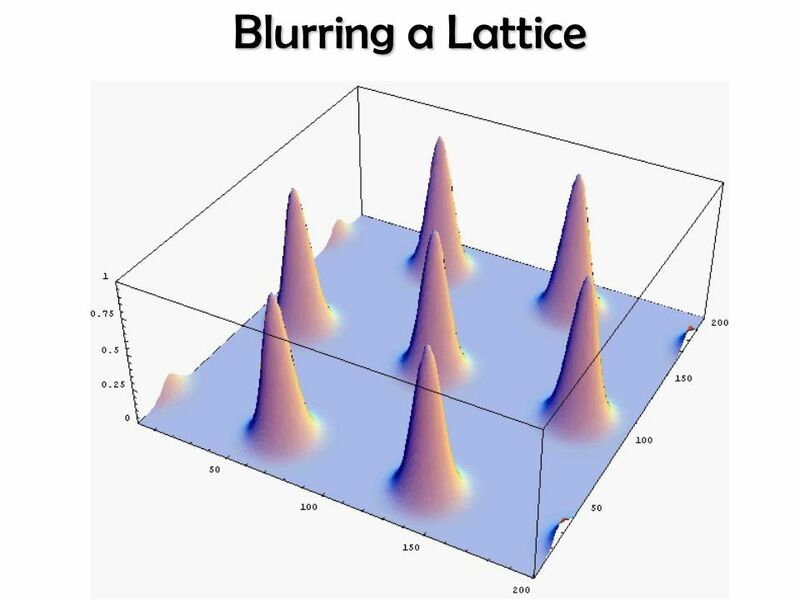 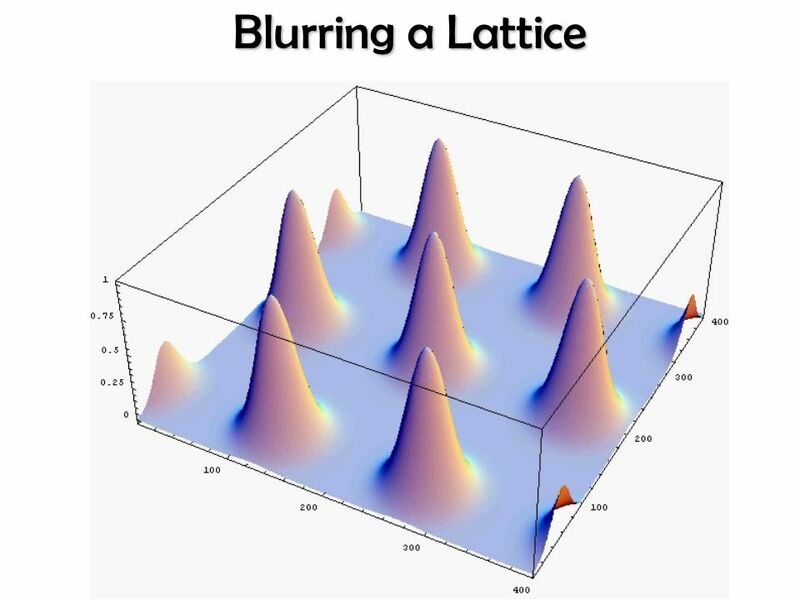 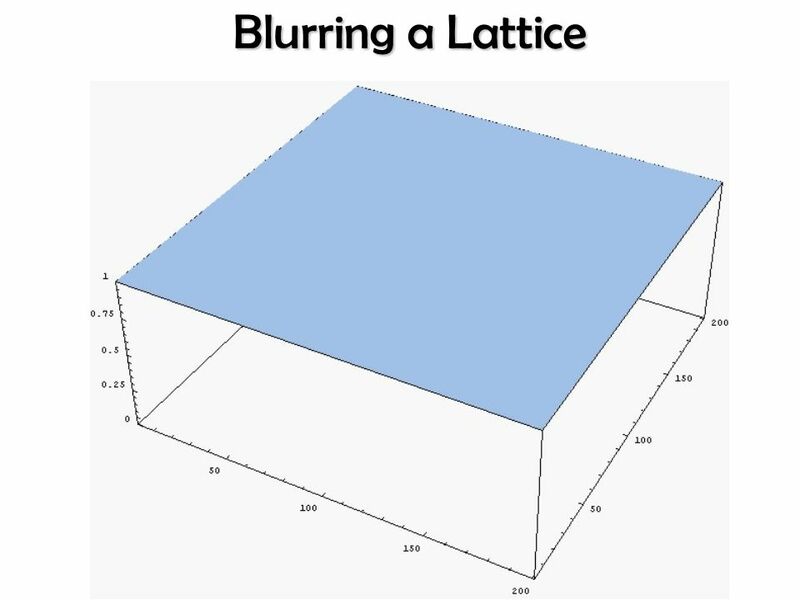 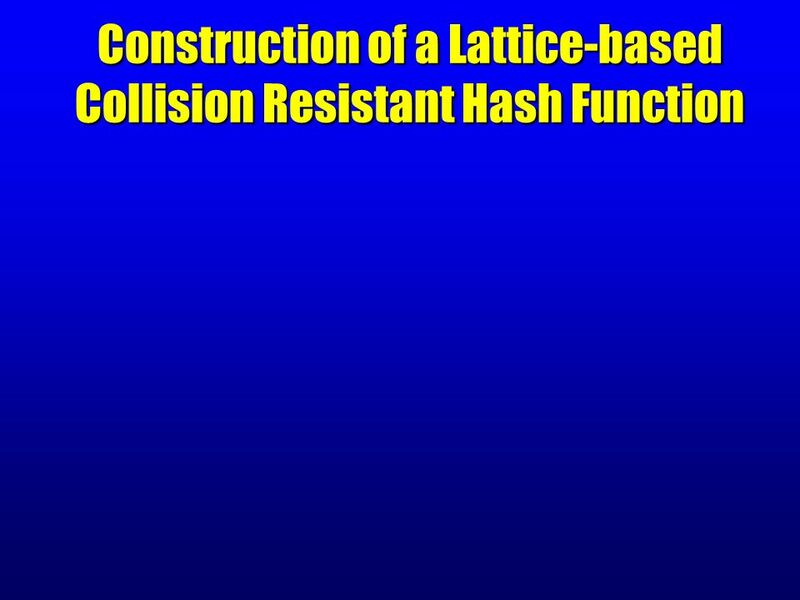 Efficient Lattice (H)IBE in the standard model Shweta Agrawal, Dan Boneh, Xavier Boyen. 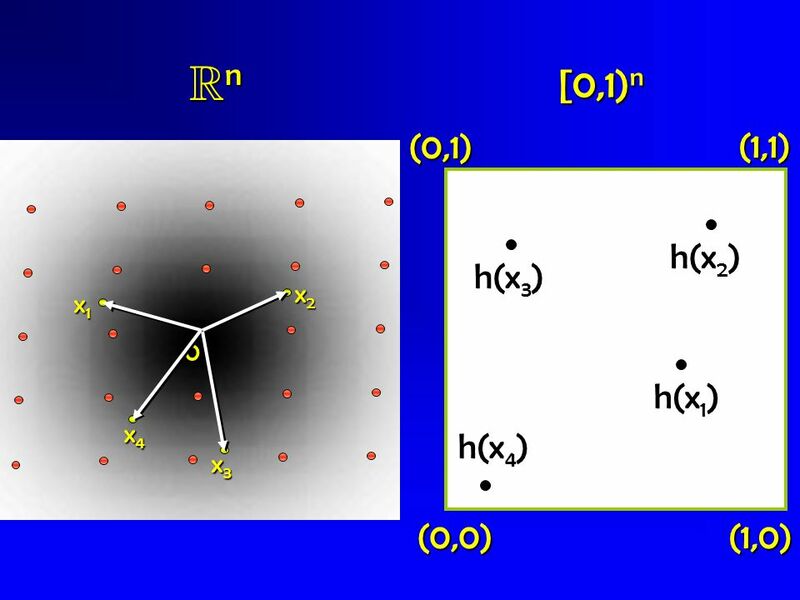 Quantum t-designs: t-wise independence in the quantum world Andris Ambainis, Joseph Emerson IQC, University of Waterloo. 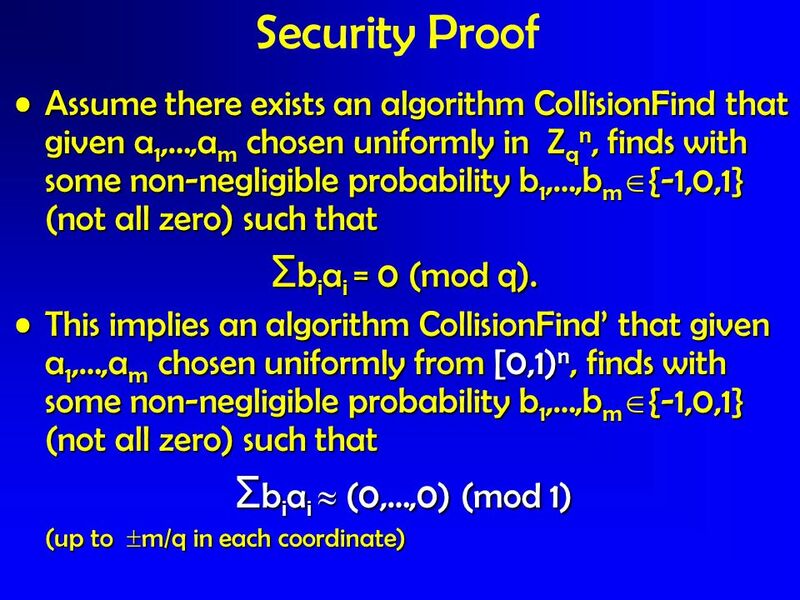 ONE WAY FUNCTIONS SECURITY PROTOCOLS CLASS PRESENTATION. 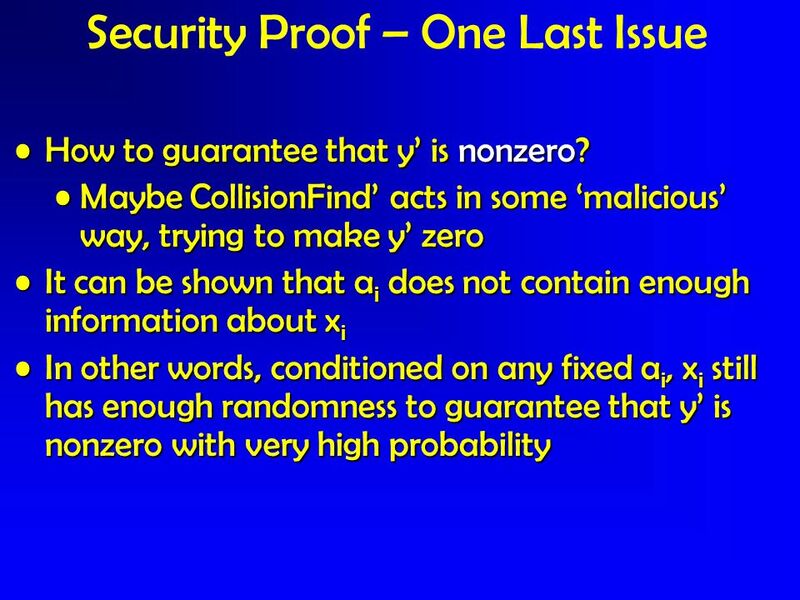 On the Amortized Complexity of Zero-Knowledge Proofs Ronald Cramer, CWI Ivan Damgård, Århus University. 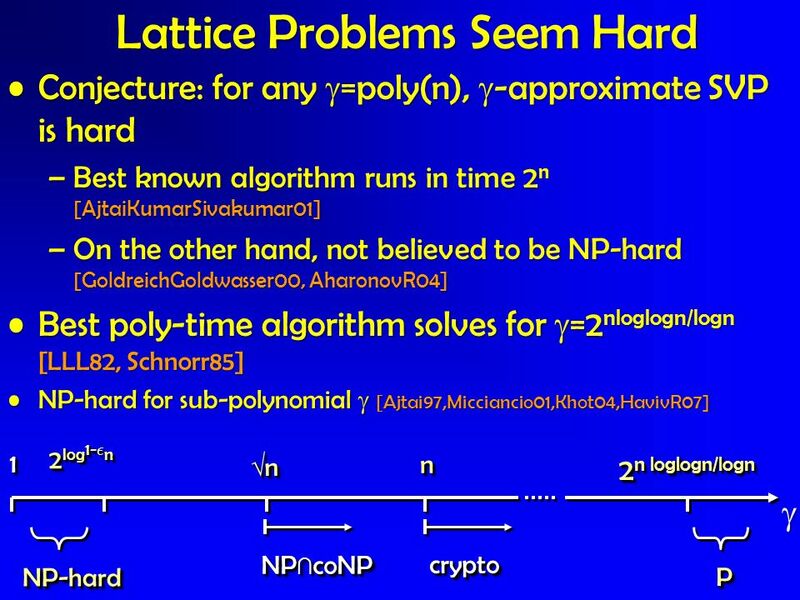 Fearful Symmetry: Can We Solve Ideal Lattice Problems Efficiently? 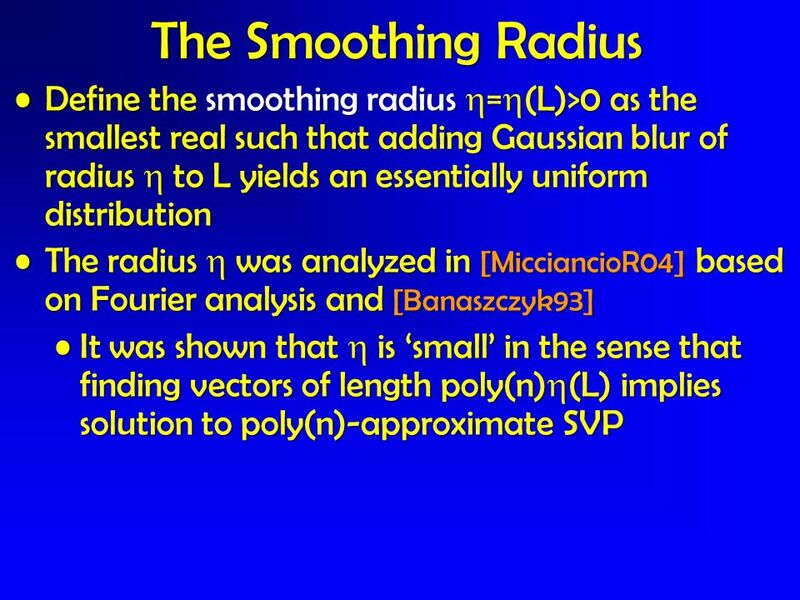 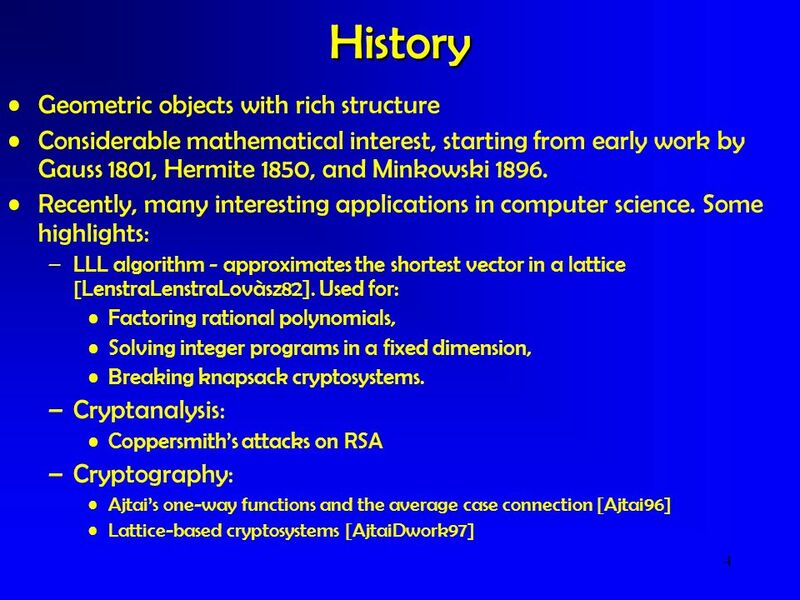 Number Theory Algorithms and Cryptography Algorithms Prepared by John Reif, Ph.D. 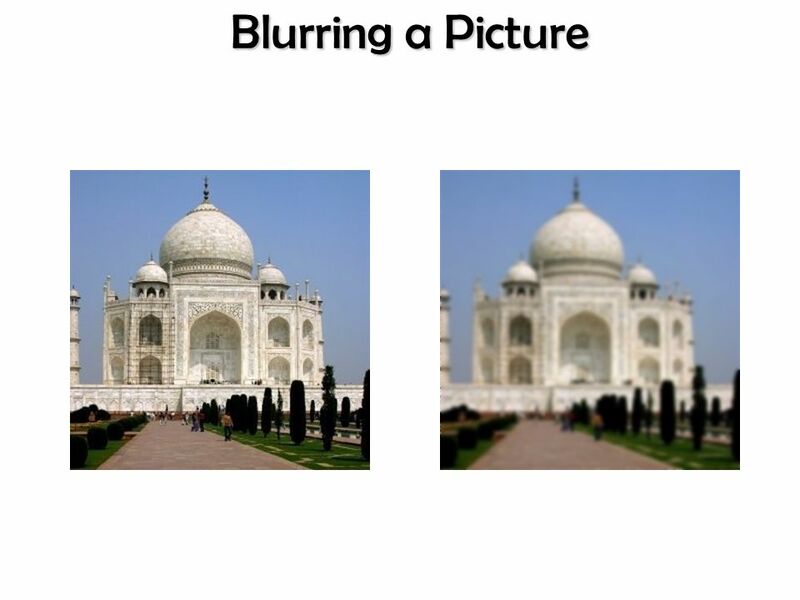 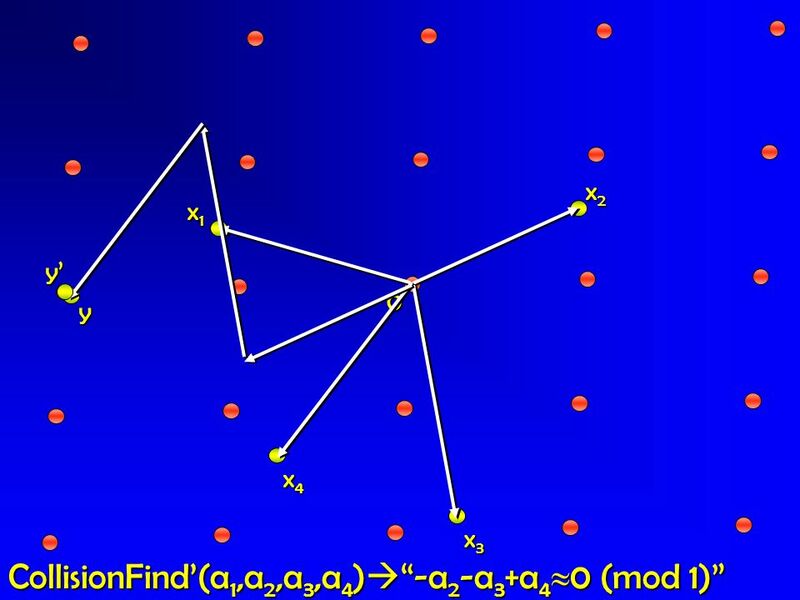 Analysis of Algorithms. 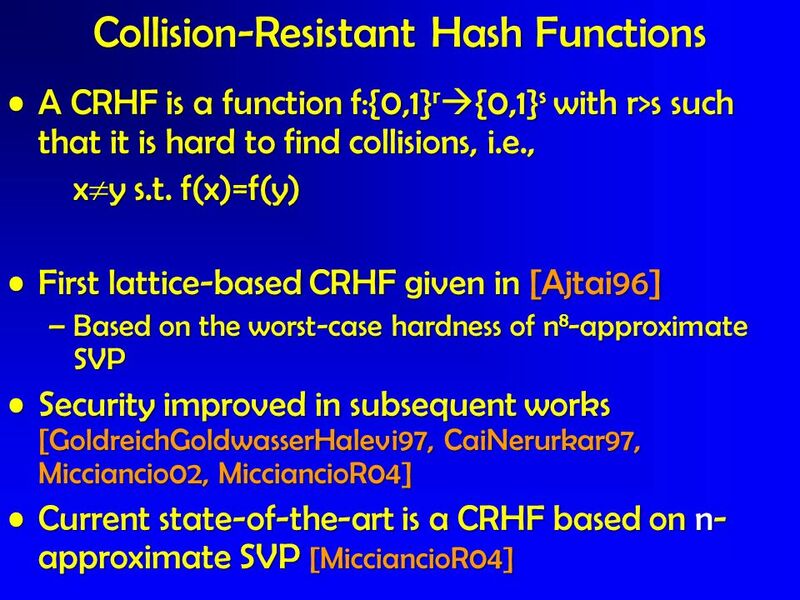 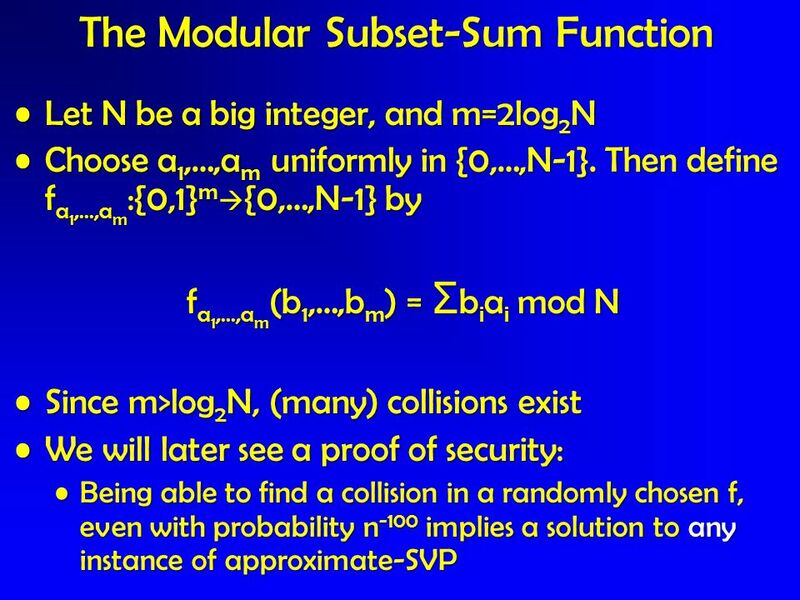 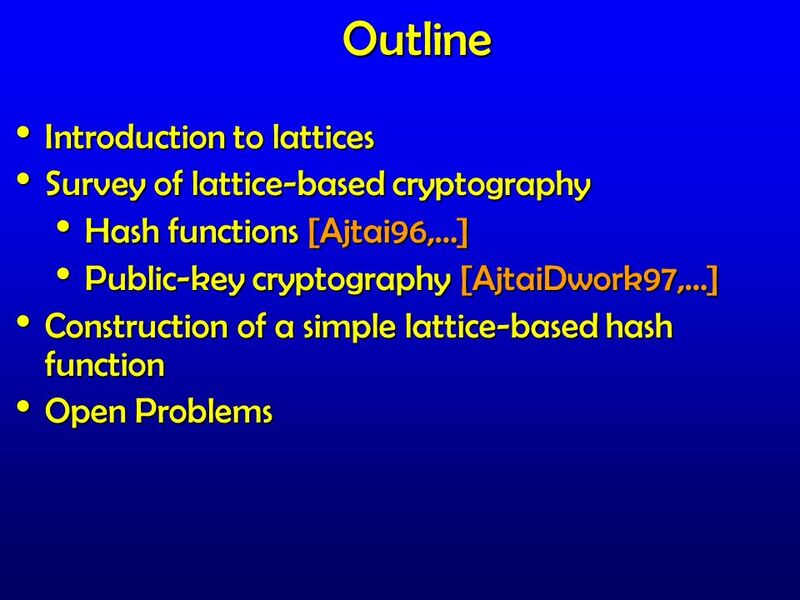 Foundations of Cryptography Lecture 10 Lecturer: Moni Naor. 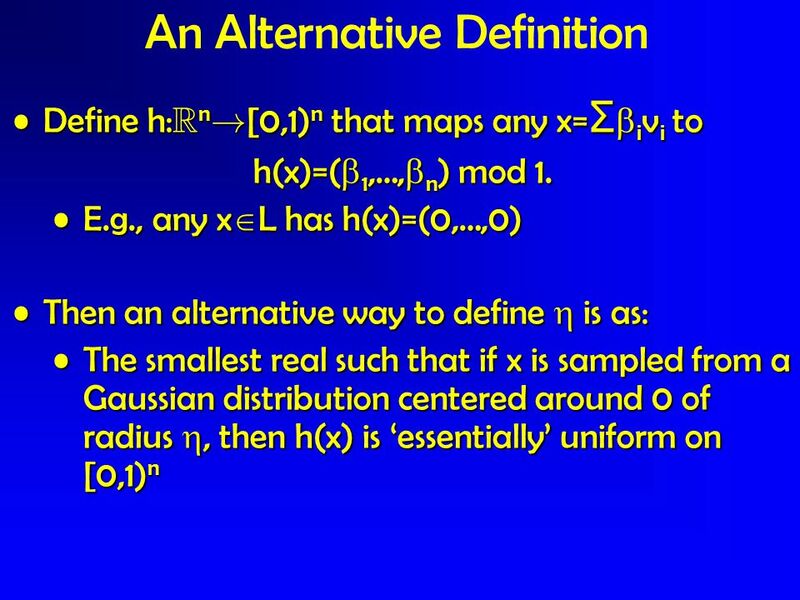 Discrete Gaussian Leftover Hash Lemma Shweta Agrawal IIT Delhi With Craig Gentry, Shai Halevi, Amit Sahai. 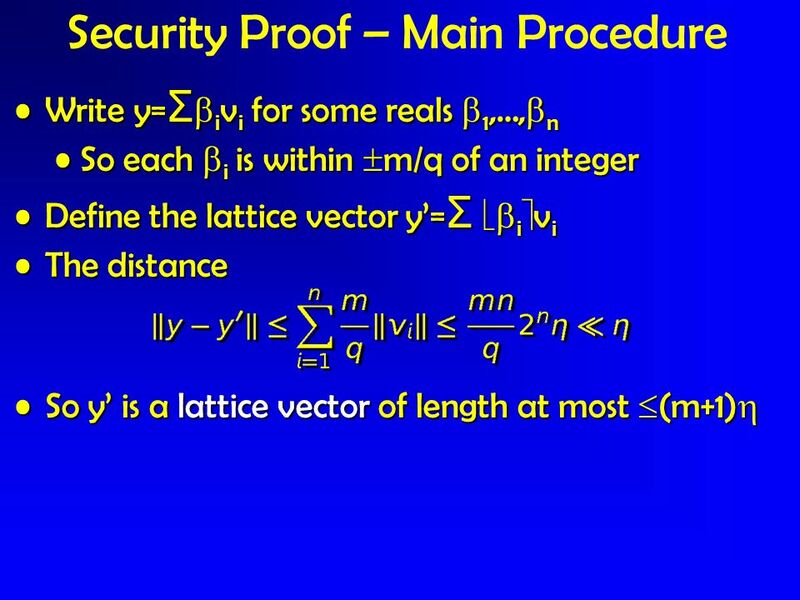 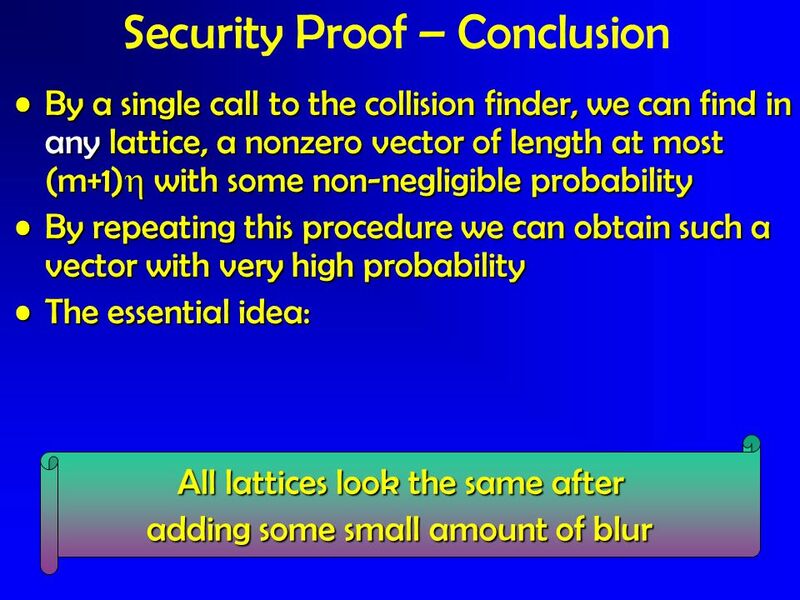 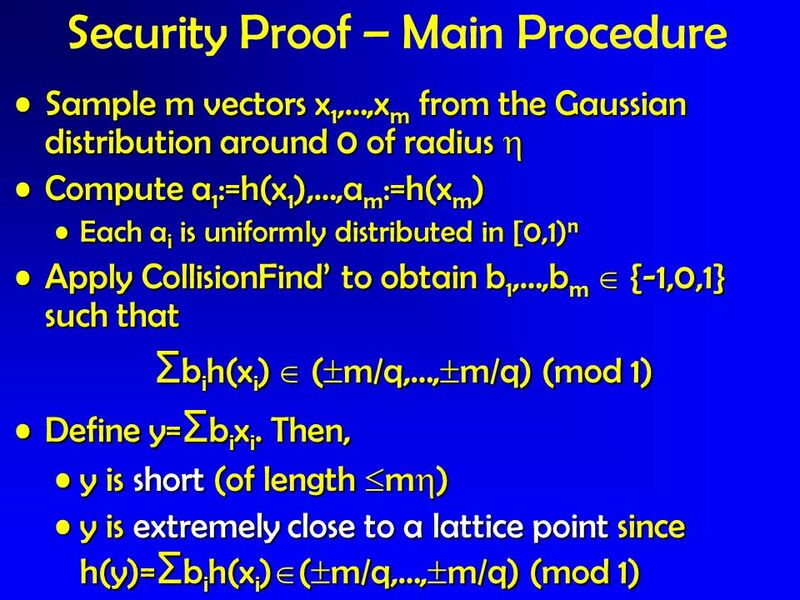 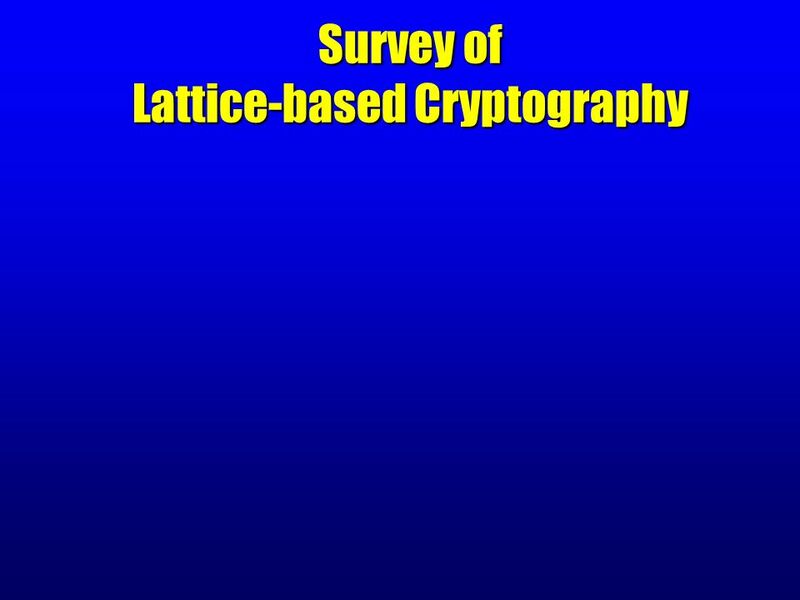 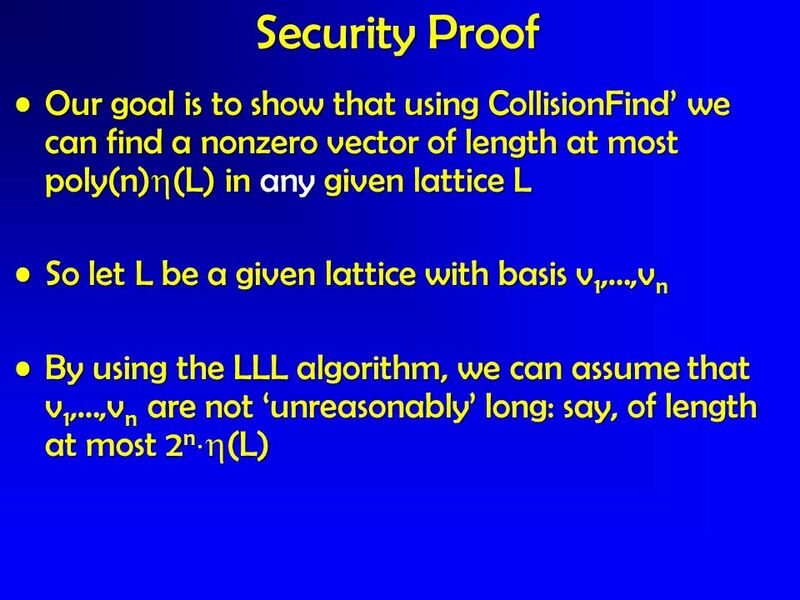 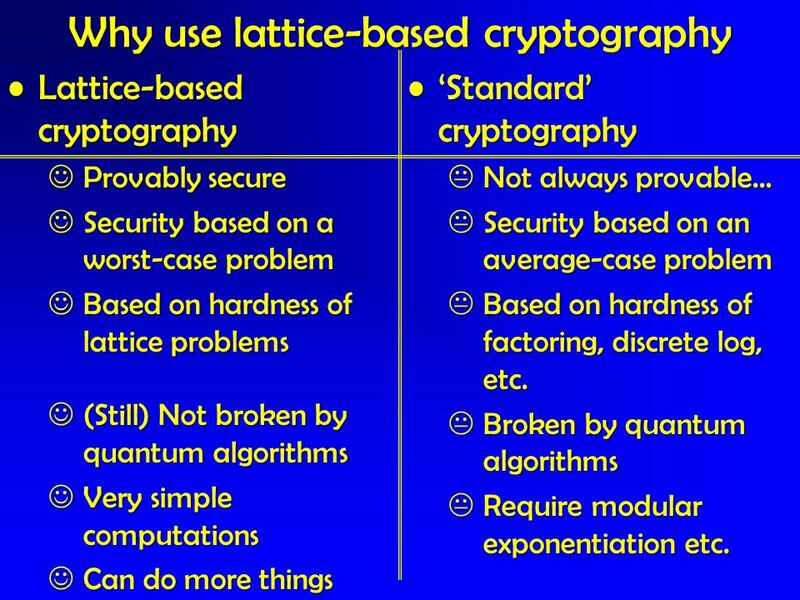 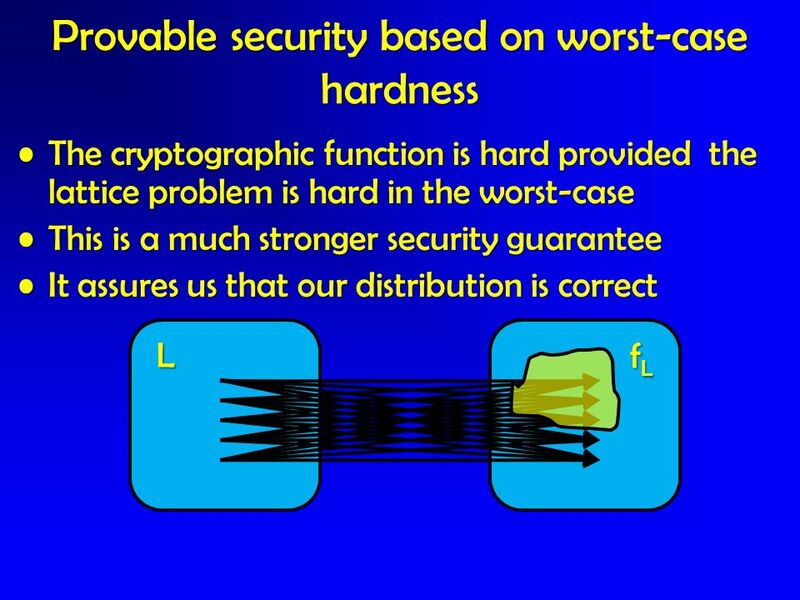 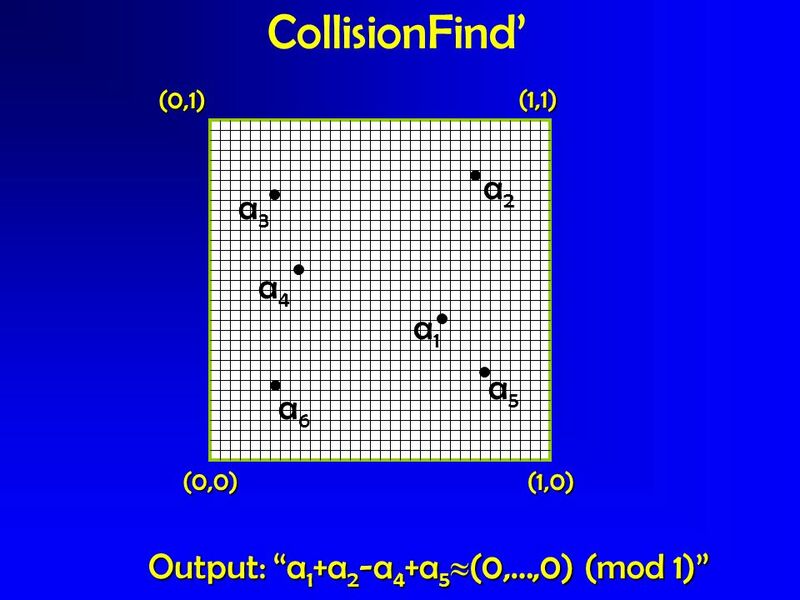 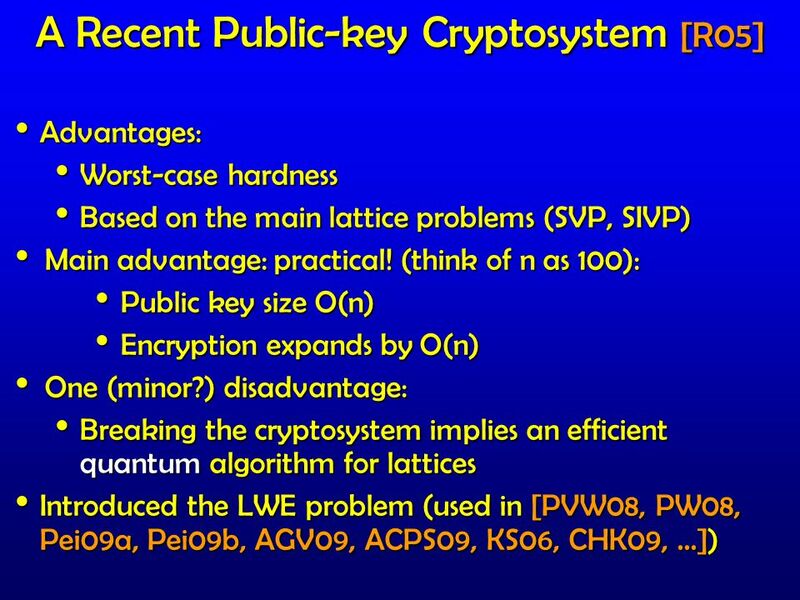 Quantum Cryptography ( EECS 598 Presentation) by Amit Marathe. 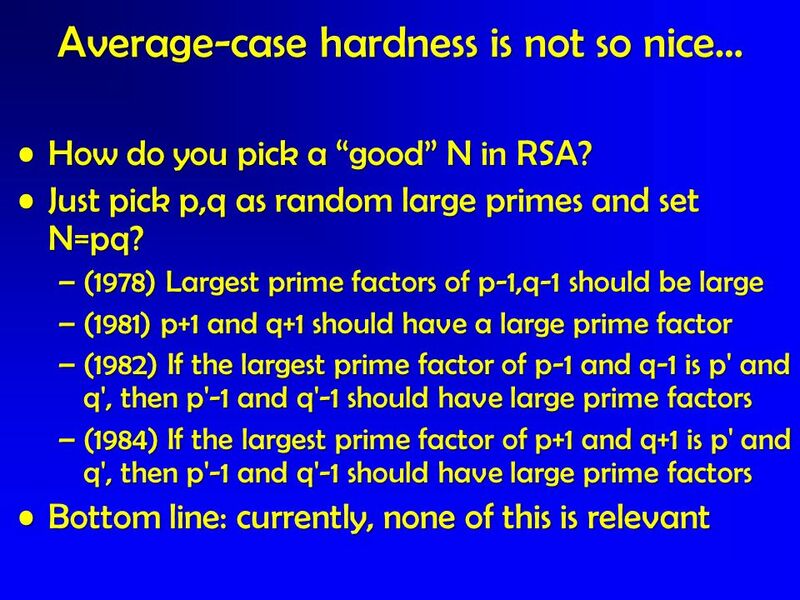 The Learning With Errors Problem Oded Regev Tel Aviv University (for more details, see the survey paper in the proceedings) Cambridge, 2010/6/11. 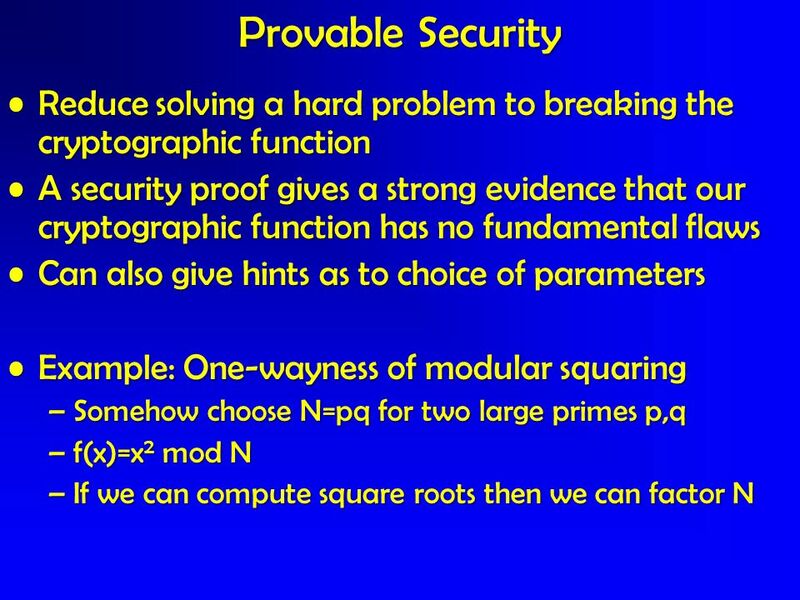 David Evans CS588: Security and Privacy University of Virginia Computer Science Lecture 11: Birthday Paradoxes. 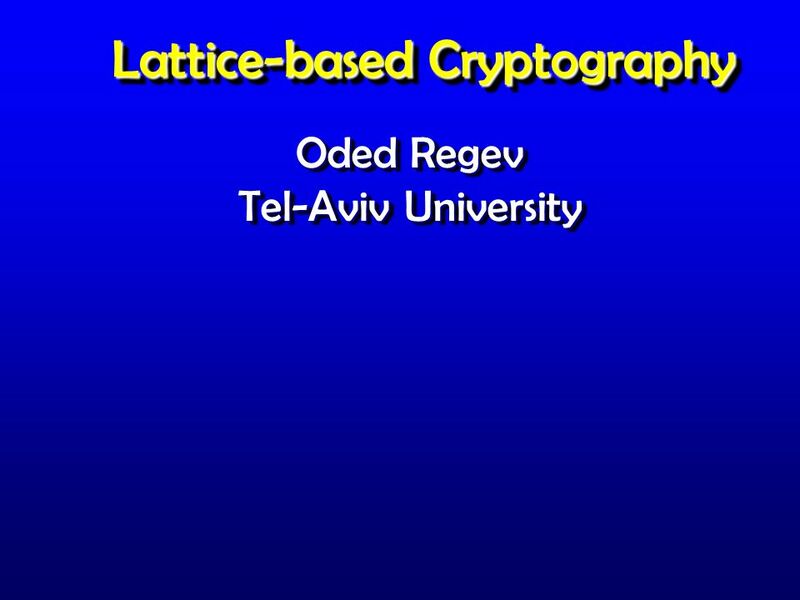 Lattice-based Cryptography Oded Regev Tel-Aviv University Oded Regev Tel-Aviv University CRYPTO 2006, Santa Barbara, CA. 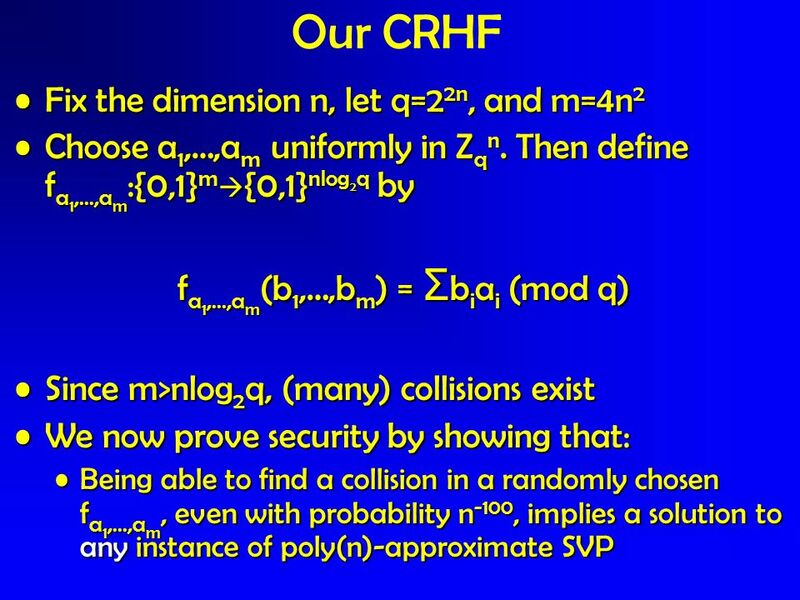 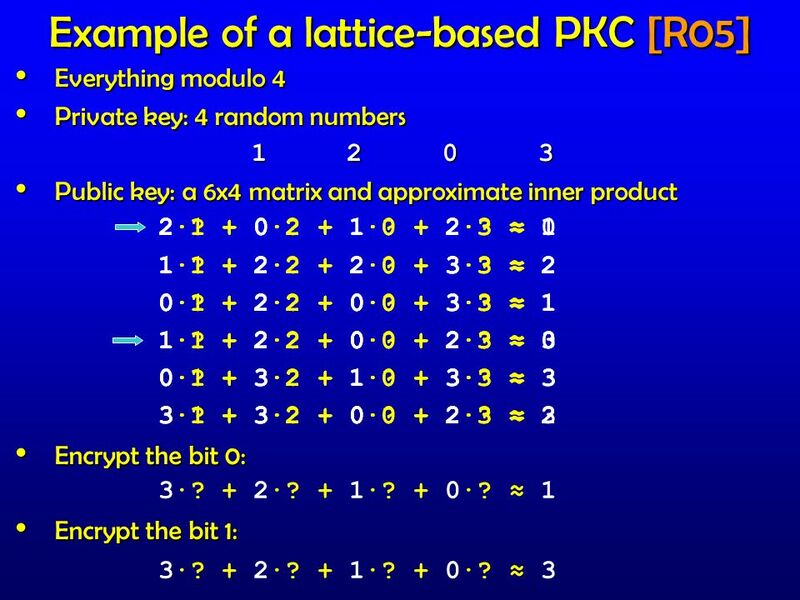 Public Key Algorithms 4/17/2017 M. Chatterjee.